Chicken wings braised in low sodium soy sauce for Christmas Eve lunch. So simple and so yum. Sprouts boiled in bacon fat, sweet potato fries, and hot cider to complete the meal. Tomorrow's 'festive' meal will be dictated by my MIL, and oh so boring. She's even dictated what I will wear. I thought I was finished with that tyranny when my own grandmother passed away 30 years ago. Perfect turkey - actually moist! Herb and pancetta dressing, mashed potatoes, gravy not quite thick enough but oh well, cucumber&tomato salad, cranberry sauce, and chocolate cherry trifle. And what would have happened if you had not adhered to said dress code? MAJOR whinging and constant criticizing of me to Mate (her only child, who is a SAINT for putting up with the rest of her idiotsincracies. To be charitable, she suffers from debilitating anxiety, but also refuses to deal with it apart from making Mate miserable). She is the Queen of inappropriate gifts, and I can't be bothered to keep track of all the tat she's given me over the years and then wants me to trot out for display at Christmas, including cheap jewelry appropriate for the pre-teen set (I don't wear jewelry except for a big oyster brooch and the delightful stuff given to me by my Discworld family). I know, I know, I should keep a box just for her junk, but I swear I'd lose the box.... In the end I wore what I wished to, and since Mate dressed down I looked pretty good in comparison, and Mate kept up a commendable babble the whole time that she completely forgot about wanting to see specific items. Yay Mate! We've decided to have a couple of days of easy - pizza and spag bol. It'll be nice to be running the dishwasher once a day for a change. tonight for New Year's Eve dinner: smoked pork shoulder with tortillas, guac, and salsa, and chocolate mousse for dessert. I am very nicely full of bbq chicken and roasted brussels sprouts. Lamb chops, baked potato, steamed spinach. I had to control myself with the chops; they are like lamb lollipops. Could have eaten all 8 at one go and then been without 3 meals for the week. 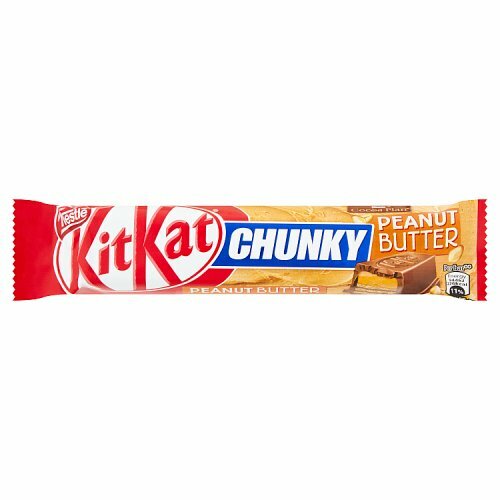 Consoled myself with a kitkat smeared with peanut butter. Have never seen one of those over here in the Colonies. In fact, regular KitKats here are nasty - dreadful chocolate - I buy only the dark ones. If it is KitKats you want then the Japan Centre is the place to visit.